This skillet beef stroganoff is a simple, classic combination of steak strips, mushrooms, beef broth, and a sour cream sauce. 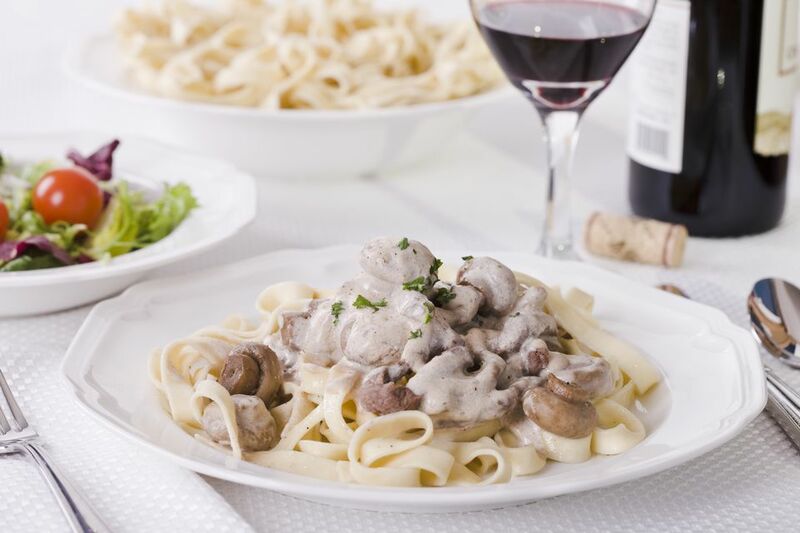 Beef stroganoff is wonderful over hot cooked noodles, but it is also excellent with rice or mashed potatoes. Add color to the dish with a garnish of fresh chopped parsley or chives. This recipe will serve a family of four, and it's easily scaled up or down for a larger family. Add extra meat for 5 or 6 people. In a skillet over medium-low heat, cook mushrooms and onion in 4 tablespoons of butter until tender. Remove vegetables from the butter; set aside. In a food storage bag or shallow bowl, combine 4 tablespoons of flour, salt, and pepper; dredge meat in the flour mixture. Place the skillet on medium heat and add the remaining butter to the skillet. Brown beef quickly in butter; sprinkle with remaining seasoned flour left after dredging the beef. Stir until blended. Add the beef stock and Worcestershire sauce to the skillet; simmer for 3 to 5 minutes, or until the beef is tender. Stir the remaining 2 tablespoons of plain all-purpose flour into the sour cream until smooth. Add the sour cream mixture to the meat mixture, stirring to blend. Add mushrooms and onions back to the skillet; cook over low heat until thickened and hot. Do not boil. Serve the beef stroganoff over hot cooked rice or noodles.